It’s Day Six of National Sewing Month! Too see the daily blog posts, projects of the day, and more National Sewing Month details, click here. While sewing can afford you an invaluable solitary haven, it’s still fun to sew socially. At AllFreeSewing we started thinking about what makes a sewing party great. If you’ve never been to one, it’s essentially a bunch of people getting together and sewing. The formula for throwing a hit, we found, is simple. All you need are people you love to chat with, a fun but simple sewing project, and food. Some of you advanced sewists may object to our recipe for success, but let us at least defend ourselves. You may not have any beef with our assertion that good friends make great sewing buddies (after all, who wants to sew with someone they profoundly dislike? 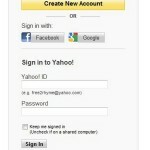 ), but you perhaps find that one should take advantage of company to tackle tricky projects. This is entirely legitimate; especially if you’re sewing for a cause or a deadline, you want to take advantage of your fellow sewists’ expertise. However, we’re strictly speaking of sewing for fun. If you’re planning a party, pick something simple to tackle. We got to thinking about our sewing and food mishaps. One minute your ruffled linen shorts are spotless, the next they’re stained with the piece of chocolate cake you tried to eat while simultaneously threading your serger. It can be a deadly combination. We took two of the necessary elements for a successful sewing social, easy patterns and food, and created a quick list of sweet sewing patterns for you to make at your next get-together. Of course, we couldn’t resist tacking on a treat for the after-party when all of your fabric is put away. Enjoy these patterns from AllFreeSewing and others, plus brand new recipes for our sister site, TheBestDessertRecipes. Try not to get too hungry. 1. Cupcake Wrist Cushion – We love this pattern. It’s a great sewing social project because it’s so simple and easy to make, not to mention functional. Once you and your guests have the body of your cupcakes made, get really creative and decorate them with embroidered sprinkles and candies. This project can be completed in the duration of the party, so these cupcakes will double as a party favor. 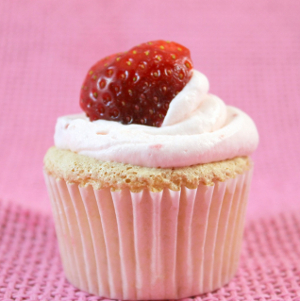 Afterwards serve Lovely Strawberry Shortcake Cupcakes. Why wouldn’t you want to enjoy these angel food treats after sewing something that looks so tasty? 2. Macaroon Coin Purse Pattern – The zipper included in this pattern is perfect for the sewing party that wants a little variation. Create this easy coin purse in one sitting with sewers of all levels. This is a cookie for the rookie. Don’t be swayed by the sophisticated end product, this design can be easily accomplished by a novice. When you’re through enjoy English Coconut Macaroons. Since your party decided to sew something totally unique, eat something with just as wild a flavor. 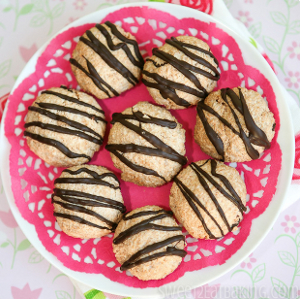 The coconut accents that abound in this cookie put a twist on a traditional treat. 3. 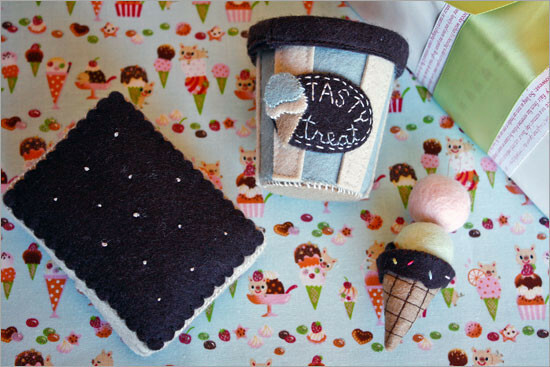 Ice Cream Gift Box, Card Holder and Present Topper – Learn how to sew gift wrapping like never before with this creative treat from Ever Kelly. We are wild about these delicious looking goodies. No doubt there is ample material here to fill your social hour (or hours) with sewing fun. Try these simple sewing project with your friends when the weather is particularly warm and enjoy a cool treat afterwards! 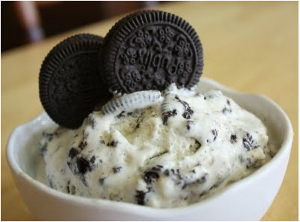 Your cool treat could be Oreo Cheesecake Ice Cream. Dish out personal portions to every guest and taste the edible translation of your sewing projects! 4. 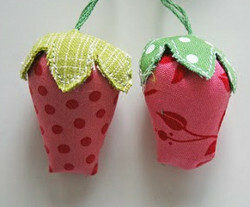 Strawberry Pincushion – Sew a naturally sweet treat with this simple sewing tutorial. 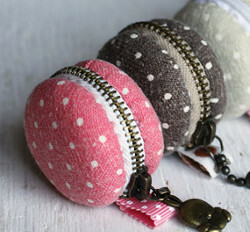 These teeny pincushions can be easily tied to your favorite pair of fabric scissors for easy transportation. 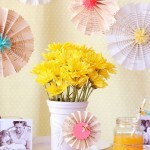 Totally adorable, these easy-to-make pincushions will be a total success. 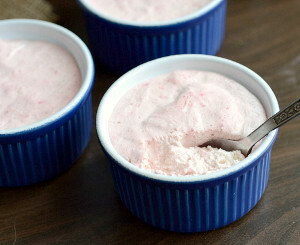 Afterwards enjoy Strawberry Banana Mousse. This unassuming dessert will take your guests by storm. Plus, it’s low-fat, so if your party is in the middle of the day everyone will enjoy this guilt-free treat. 5. 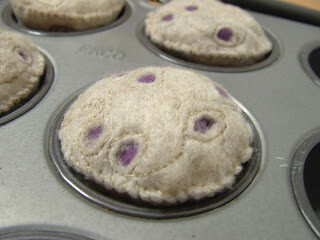 Felt Food Muffins – This is a purely playful project from Pieces by Polly. Consider making this fun felt food if you have some youngsters attending the party. Easy to make and fun to play with afterwards, this simple sewing project will be a healthy reminder that sewing for the sake of fun is always worth a try. When you’re finished serve Blueberry Muffin Tops. 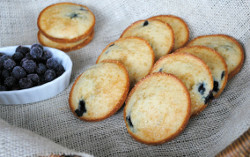 This spin on the classic muffin is a great party treat. And there you have it! Some options to host a great sewing social. Our compliments to TheBestDessertRecipes for providing the real counterparts to our sewn treats. Do you snack while you sew? Snacking and sewing are mutually exclusive. Usually when I am sewing or working on a craft project I totally forget about eating. What a fun way to lose weight! If I get the house to myself I don’t snack as I’m into doing crafts or cleaning. When the family is home and I have to stop crafting or cleaning I snack. No, I do not eat while sewing. I want to keep my project and my sewing room clean. I break from sewing or crafting and have a snack with the hubby at 3 in the afternoon. The question asking if I snack when I am sewing; sometimes I do. Usually a bite size pretzel and a soda in a cup with a lid on it, that is my preference. Somehow, the pretzel helps keep me focused on what design I am working on, as well as shuts out other noises that might distract me. The soda is a ttreat that I enjoy but must have a lid on it so nothing gets wet if I accidently knock it over. I get busy and often forget where my drink is. Sewing with a friend is great but sewing with my 10 year old granddaughter is fantastic! She is anxious to learn too. I know I shouldn’t, but sometimes I just can’t resist.